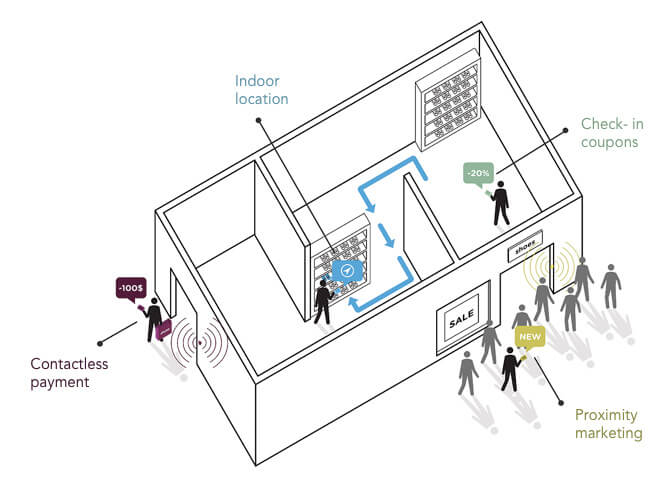 On entering the area of influence of a beacon, the mobile phone detects its presence and triggers a corresponding action: display a custom message or launch an application. HOW IS BLE DIFFERENT FROM REGULAR BLUETOOTH ? BLE is 60-80% cheaper than traditional Bluetooth. BLE is ideal for simple applications requiring small periodic transfers of data. Classic Bluetooth is preferred for more complex applications requiring consistent communication and more data throughput. Design building structure, route and navigation. Setup of beacons, configuration and caligration. Test of positions and navigation using a dedicated App. Build the mobile App using the navigation SDK. Do you want to learn more about it ?